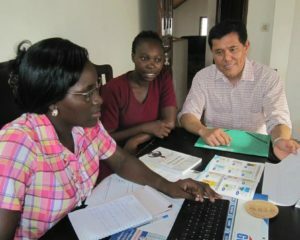 Like a doctor who pays house calls to patients upon request in many parts of the world, our “Dr.” Ramon Rocha treks the globe to offer a confidential listening ear and advice for various publishing ailments. Since 2012, he has extended MAI’s consulting services to Christian publishing leaders and writers in 25 countries as Director of Publisher Development. In many cases, no other professional help is available. We asked Ramon to give you a sneak-peek at his itinerant consulting. Ramon enjoys a break with Ukranian publisher Andrew Kravchenko of Ezdra Publishing at LittWorld 2015. Photo courtesy of Karen Crespo. 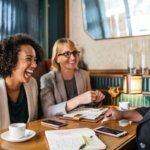 What does your consulting visit look like? I try to come more as a friend than an expert. My ideal three- or four-day visit allows me time to listen to the publisher’s challenges and issues, brainstorm solutions with the team, identify possible action steps, and pray with the team. I check in afterward by email and at times video calls. A follow-up consulting visit may be as short as a day. Occasionally I lead brief trainings for local writers upon the publisher’s request. Sometimes I have the privilege of sharing a meal or staying with the publisher’s family. I’ve been touched many times by the love and care of my hosts and their generous hospitality. Consulting with the marketing and sales team of Editions PBA, an IFES-related publisher, in Benin. What do you carry in your “medical kit”? I try to assess the publisher’s situation before my arrival so I have an idea if the need is marketing, finance, editorial or publishing leadership. I create a presentation and come ready with templates, Word or Excel files and links to helpful websites. Sometimes I have to respond to an issue that surfaces during the consultation. Then I refer back to my “medical kit” of previous Powerpoints, charts and my Evernote files to find the appropriate tools. The publishers have appreciated stories from my business background and/or helpful steps other publishers have taken. Have you ever found it particularly hard to help a publisher? If so, what did you do? Publishers struggle with a relatively small reading public in some countries. Others face political, economic and social conditions that make it hard to achieve a healthier financial standing. Or a publisher may be involved in a long legal battle or a soured relationship with a problematic staff or director. I urge them to refocus on their vision of how Christian materials can impact peoples’ hearts and minds. I also propose ideas to challenge publishers to look beyond their problems. 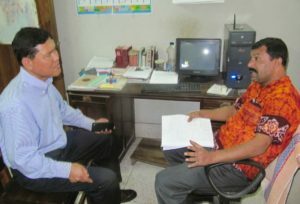 A magazine publisher in Bangladesh shares his concerns. What is the most common publisher’s ailment that requires a clear solution? Pricing with a profit is a major concern especially where people expect Christian books to be either free or very cheap. Sometimes the healthy tension between being a ministry and a business is evident, especially in determining the right price. How to reach a broader audience beyond the Church is another struggle. A publisher has to be willing to change paradigms and do more than the status quo. I’d like to see more publishers become goal-oriented and disciplined to measure outcomes, and make adjustments quickly. Tell us about a recent highlight on one of your visits. On one return visit, I was so encouraged to find a publisher reporting higher sales and showing a net profit, plus soliciting feedback intentionally from readers. In another instance, I applauded a publisher’s success in moving books from its former inventory “cemetery” by slashing prices and donating. On one sad occasion the action steps we identified during my first visit were not implemented. I tried my best to be extra tactful not to scold, and to be even more encouraging. I knew I could only make suggestions; the actual work is with the publishing team. 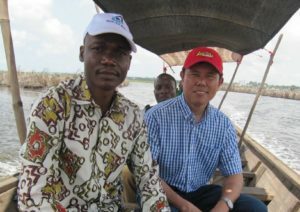 Enjoying a boat ride with Georges Late, manager of Editions PBA, in Benin. How would you advise publishers to stay healthy? Keep an eye on maintaining high quality editorial standards while remaining passionate about your mission and vision. Ingredients for long-term publishing success include: quality writing by reader-sensitive local authors, polishing by skilled editors, creative marketing strategies and effective distribution. How does your own faith play into your work? How can friends pray for you? I need to be consistent in drawing strength and encouragement from God’s Word myself. Please pray that I will not be too technical as a consultant or teacher but serve more as a caring friend. Please pray for publishers to persevere, especially amidst a lack of peace and order, and political and economic tensions. Pray they will be courageous in publishing God’s truth in creative ways, build bridges to unbelievers and strengthen the national Church. Pray that these publishers will be financially sustainable, profitable and growing. Christian publishers and writers “on the front lines” are being equipped and encouraged because of your partnership with MAI. I thank God for MAI contribution in building God’s kingdom. 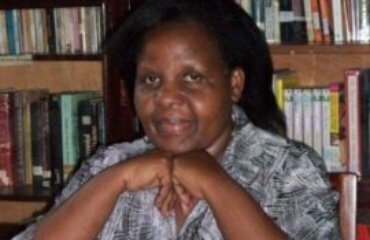 The interview highlighted the challenges publishers experiences and am glad Ramon and hopefully others have been mentoring and coaching other publishers. Keep up the good work. Many thanks for your encouraging words, David. Mr.Ramon Rocha is a good Physician, humble and patient. Many thanks, Sylvia, for your kind words!